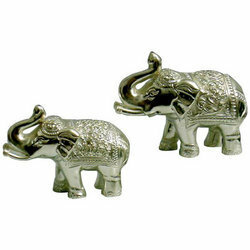 With more than 10 years of industrial experience, we have become one of the reputed names engaged in offering a wide range of decorative silver handicrafts comprising silver furniture, silver coated sofa, antique sofa set, antique zhoola, decorative candle stands, silver planters, silver antique boxes, silver fruit bowls, decorative showpieces, silver surahi, decorative silver statues etc. Known for its alluring designs and flawless finish, our range is in high demand by our clients spread across the world. Furthermore, our state-of-the-art machinery and competent team members enables us to execute bulk order within reasonable time frames. With the increasing global demands for our handicrafts, we strive to maintain high standards in our range of handmade handicrafts and keep ourselves updated with the market trends.